Ignacio’s Briana Duran wards off Del Norte’s Brianna Gallegos while booting the ball forward during Friday afternoon’s match at IHS Field. Del Norte won 6-0. The Durango High School girls soccer team found a way to win on the road Friday with a 3-2 win against 5A/4A Southwestern League foe Grand Junction. Durango (4-4, 2-2 SWL) struck first in the 10th minute when Jael Larson scored her first goal of the season. Grand Junction (5-2, 1-2 SWL) tied the game 10 minutes later, but the Demons struck again before halftime with a goal from senior midfielder Kayla Rubenstein just past the half hour mark. It was 2-1 Durango at halftime. In the second half, junior forward Hannah Coster scored her team-leading sixth goal of the season in the 60th minute to make it 3-1. The Tigers would score one more, which came in the final 30 seconds of the match to make it 3-2. DHS will hit the road and take on Delta (6-3, 3-1) at 4 p.m. Thursday. Del Norte 6, Ignacio 0The Ignacio High School girls soccer team was unable to continue its winning ways, as it dropped its home opener 6-0 to Del Norte on Friday afternoon. 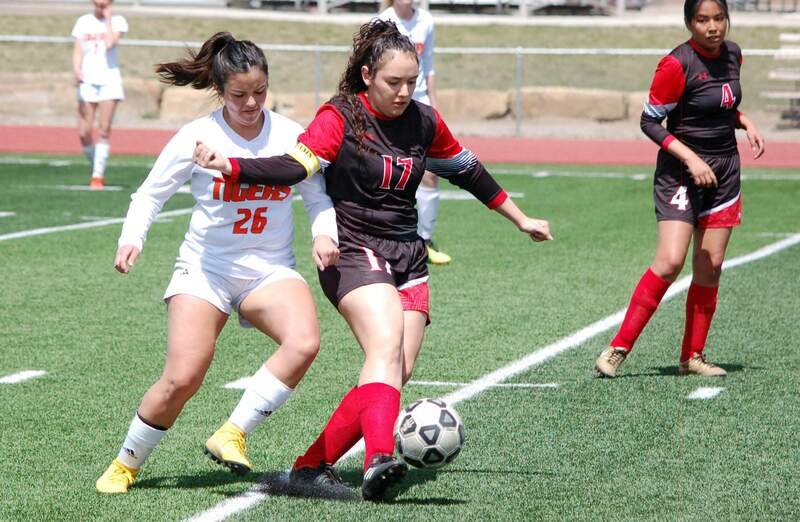 The Tigers (6-2-2, 4-1-2 Class 3A/2A Southwestern League) got on the board in the first minute with a goal from Lacie Jones, which came unassisted. Jones doubled her goal total when she slotted one home with an assist from sophomore midfielder Soren Bailey in the 24th minute. Ignacio (1-4, 1-3 SWL) tried to contain the Tigers’ attack, but Del Norte would strike twice more before halftime. In the 30th minute, junior forward Kendra Parra scored, while Jones tallied her third goal of the afternoon in the 36th minute. Del Norte led 4-0 at halftime. In the second half, Parra added her second goal, which came in the 52nd minute, and Jones added one more for good measure just one minute later. The Bobcats had an opportunity to get on the scoreboard in the 76th minute, but Alexis Pontine’s one-on-one opportunity was saved by Myka Glover. Ignacio’s sophomore goalkeeper Rylee Pearson unofficially made 21 saves. IHS will take on Montezuma-Cortez at 11 a.m. Saturday at Cortez. Girls TennisThe Durango High School girls tennis team lost both matches Friday afternoon in Southwestern League play with 6-1 losses to Fruita Monument and Grand Junction. In the first match against Fruita, No. 3 singles player Emma Jaber got the lone win for DHS after she won 6-2, 6-3. Alex Jo Williams beat No. 1 singles player Emma Hackett 6-1, 7-6. In the second match against Junction, the No. 2 doubles team of Rebecca Bowers and Laura Clark took down Lauren Lewis and Kylie Hanks 0-6, 7-6, and 7-5 in the tiebreaker. Two other DHS players forced third-set tiebreakers, but Kamryn Peltier beat No. 2 singles player Lily Chick 6-7, 6-4, 10-4, while Grace Rose beat Jaber, 2-6, 6-1, 6-0. DHS will take on the same teams beginning at 9 a.m. against Grand Junction, followed by Fruita at 11.